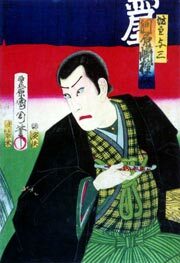 The zangirimono "Tsuki no En Masu no Igaguri", commonly called "Irogoyomi Gen'yadana", was staged for the first time in the 10th lunar month of 1872 at the Moritaza [casting]. 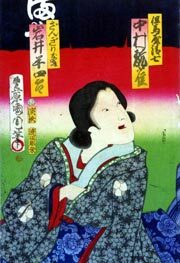 This rare drama was revived in January 1930 at the Imperial Theater, starring Ichikawa Sadanji II and Onoe Baikô VI in the roles of Yosaburô and Otomi, and in January 1999 at the National Theatre [casting]. As the play opens, Seishichi is accidently drenched by a maid throwing water at a stray dog. He is taken into the house and removes his hakama divided skirt so that it can be dried. The mistress of the house, Otomi, is profuse in her apologies and insists on him sharing a cup of sake with her. As they drink, she comes on very strong to him, putting her face close to his, holding his hand against her breast and leaning over him from behind. A flustered Seishichi is unaware that they are being watched by Yosaburô. Seishichi is married to Onaka and is the young master of the Tajimaya kimono shop, but he has been adopted from another family. One day a samurai arrives at the shop with gifts to cement a marriage arrangement. The person to be married is Seishichi. Of course Seishichi and his wife are astonished, but the 'samurai,' Yosaburô, who is actually a renegade priest and secretly Otomi's husband, says he has proof of Seishichi's affair with Otomi. First, he produces Seishichi's hakama, and then a long lock of hair which Otomi has cut off as a sign of her love. Otomi then appears in person with short hair and no matter how much Seishichi protests his innocence, no one believes him. The owner of the kimono shop appears and settles the matter with 100 gold pieces. As soon as they have the money, Yosaburô and Otomi immediately change their manner and candidly confess that they are blackmailers. After they leave, Seishichi is told to return to his own family. Some time later Otomi is visited by her mother who needs 100 gold pieces to give to the Daimatsuya family she once served. Otomi wants to give her the money that she and Yosaburô swindled, but Yosaburô has disappeared with it. At this point Seishichi appears intent on unleashing his anger on Otomi, but her mother intervenes only to realize in shock that Seishichi is the son of the Daimatsuya family to whom she owes her loyalty. Otomi is horrified that she has been the cause of so much trouble to someone to whom her family owes allegiance and promises Seishichi she will settle the matter properly. She asks him to take her mother hostage until the issue is resolved. In addition, she writes a letter to the owner of Seishichi's former kimono shop asking him to forgive Seishichi and sends her maid off to deliver it. When Yosaburô returns, he is tipsy and in no mood to discuss the money, which he has lost on gambling anyway. Otomi makes to kill him, but in the clamor Seishichi emerges from the back of the house and accidently stabs them both. Seishichi's wife and the kimono shop proprietor come rushing in response to the letter Otomi had sent. She had written that she was going to die to atone for the wrongs she had caused. Yosaburô admits that he too is indebted to Seishichi's family and so allowed himself to be stabbed by Seishichi. 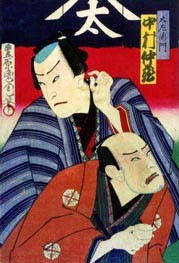 As the play ends, Seishichi is restored to his position in the shop and is reunited with Onaka, while sadly the cropped-haired swindlers die in each other's arms.